Those suckers paid for my plane, mwuhaha! 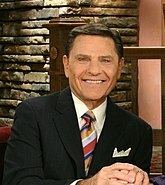 Kenneth Copeland (December 6, 1936–) is a televangelist and faith healer from Texas. His TV show is called The Believer's Voice of Victory and is featured on Paul Crouch's Trinity Broadcasting Network and many local TV stations. He teaches a theology he calls "Word of Faith", also called name it and claim it by critics. He has come under criticism for taking donations from cancer patients who believed his teachings that God would heal them as a result of donating, for leaving business partners in debt from a failed real estate venture, and for spending funds donated to the ministry on lavish personal vacations in his Cessna jet. He defends this by saying that commercial airplanes are filled with demons. Copeland Ministries have been accused of abusive Discipling and Shepherding that requires unquestioning obedience from members and Copeland has been described as similar to a cult leader. An oath of allegiance was required of church members. When a church employee's mother came out as a lesbian the daughter was told to stop considering her own mother as family. A dissident worker was shunned by former close friends. Kenneth Copeland Ministries' Eagle Mountain International Church (Newark, Texas), a megachurch pastored by his daughter, experienced a measles outbreak in August 2013 because many of the parishioners had followed Kenneth Copeland's teaching to rely on Dr. Jesus to keep them healthy rather than vaccinate. Oops… Kenneth Copeland Ministries then reversed their position on vaccination and the church began offering free vaccination clinics. In 2010, 3 years before the outbreak Copeland claimed he was shocked over how many vaccinations were advised for his grandchild while his wife stated that she and her husband needed no prescription drugs since, "the Lord heals all diseases". Copeland once famously claimed that anyone who is a "True Believer" should be immune to PTSD and that anyone affected by it should "get rid of it" by praying. This was so offensive that Copeland was barred from giving planned speech on a military base. He once claimed that Barack Obama had the Mark of Cain and would therefore never have God's favor. Despite being one of Donald Trump's chief spiritual advisors, Copeland actually originally supported Ted Cruz, claiming that Cruz had been "anoited by God" to be the next President. He once compared himself to Osama bin Laden, "but in a good way!" He has often criticized "progressive socialism." This page was last modified on 10 August 2018, at 07:24.